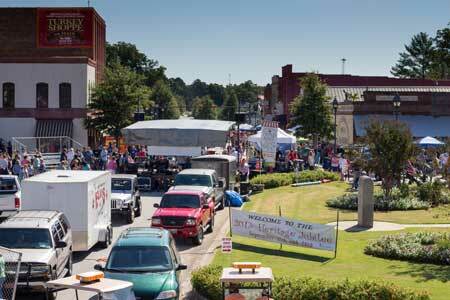 The Heritage Jubilee Festival came to the town square. Wanda and Sonny Seawright did well in their job of directing the 12th Annual Heritage Jubilee which happened on the square in Edgefield on Saturday. They have a history with festivals in Edgefield. Years ago, it started as the Halloween Festival on the square. They became affiliated with it and this fall event took place on the square into the nineties. Around 2002, they took it over again and it was then the Heritage Jubilee and first held on the Soccer Field, then the Kendall property. Joel Jolly held successful festivals after that at Oakley Park for a few years, centered around the BBQ Cook-off (and great music) which has grown into a large attraction for BBQ folks over the state and beyond. 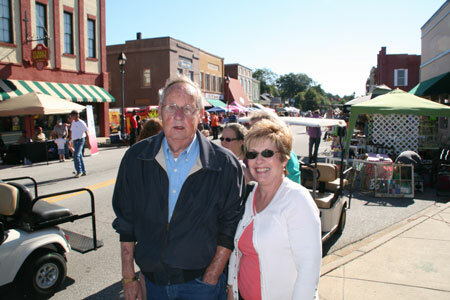 Sonny and Wanda Seawright the morning of the festival. This year, under the Seawright leadership, the festival came back to the square and it looks like, according to Sonny, it will stay. The Cook-off was on Friday night and Jolly remained in charge, and due to some confusion with the changes, the crowd was lighter — but the BBQ and the “Not BBQ” appetizers of Friday evening were smashingly good, said one attendee from Johnston: “It was successful,” says Jolly. As for crowd, Sonny believes “around 3000 attendees.” The number of vendors (who came as far away as Savannah and Conway), including crafters, food and business representatives, was 85. Crowds filled the streets throughout the day and downtown businesses were pleased, according to report.